In a year that has pushed the envelope in terms of experimental filmmaking, is there still a demand for simplistic cinema? Or is it in fact more ambitious to do the stripped-back style well, with solid acting and an intelligent script, than convolute your story with gimmicks to stand out from the crowd? Belgian director Michaël R. Roskam brings together an excellent cast for neo-noir drama ‘The Drop’, which harks back to the classic gangster genre movies where nobody can be trusted and danger lurks around every corner. 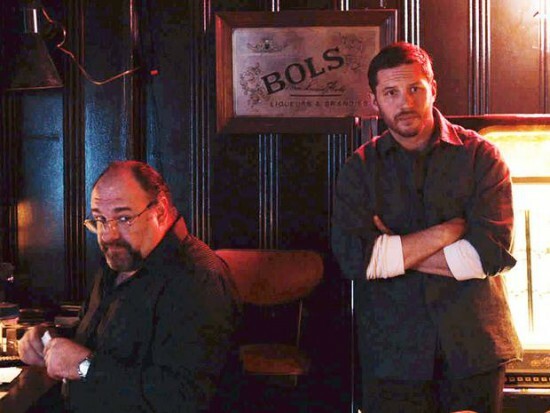 Tom Hardy stars as soft-spoken and unassuming bartender Bob Saginowski who looks after a drinking den alongside his Cousin Marv (James Gandolfini), which is regularly used as a ‘drop’ for the local lowlifes to launder their illegally gotten gains. When a robbery takes place after hours, Bob and Marv find themselves in a precarious predicament, forced to face the wrath of the mob. Brooklyn’s grimy underworld provides the backdrop for Dennis Lehane’s tightly woven script to unfold. Having previously worked on The Wire as well as collaborating with legendary crime film director Scorsese, his influences are clear as they bleed into the flawed but fascinating characters. Very much character driven rather than narrative driven, the study of the morals and masculinity of the protagonists is always interesting and an appealing subplot plays out naturally about the responsibilities involved in taking on a pit bull pup. While events never really veer too far out of the ordinary story-wise, Roskam puts on a masterclass in tension building, heightening to a satisfying final third. It is of course terribly sad that this film will mostly be remembered for featuring James Gandolfini’s final screen performance, but it is testament to how phenomenally gifted he was as an actor. Widely known for his long-running portrayal of New Jersey mob boss Tony Soprano, he was an expert in complex multi-faceted drama and playing cowardly Cousin Marv serves as a fitting swansong. Not to be outdone though is Tom Hardy, who matches Gandolfini blow for blow in a battle of acting prowess and again proves himself as one of the best of his generation. He gives a controlled and more subtle turn than we are used to seeing from him, nailing the accent and showing that sometimes less is more. ‘The Drop’ is an effective throwback genre picture, and what it lacks in narrative imagination, it makes up for with the powerful screen presence of the leads. The term ‘actor’s movie’ has never felt more apt. Roskam and screenwriter Lehane present a bleak Brooklyn exterior, an unappealing interpretation of the big apple which hides a black and bloody core of corruption. In this environment, it is equally dangerous whether you’re propping up the bar or serving beers with Bob and Marv from behind it, but where Hardy and Gandolfini are concerned, consider the metaphorical acting bar raised. This entry was posted in DVD and tagged dennis lehane, james gandolfini, michael r roskam, the drop, tom hardy. Bookmark the permalink. Good review. The material may be a bit conventional, but the cast is so good with it that they’re willing to change it up in ways that makes it better.